Increasingly those of us working in the immigrant and refugee serving sector have recognized the importance of municipalities in immigration, immigrant and refugee settlement, and inclusion. It took the provinces and the federal government a bit more time to acknowledge this but it came together for us in Ontario in 2005 with the signing of the Canada-Ontario Immigration Agreement (COIA, which expired in 2010) which for the first time formally recognized the important role municipalities have to play in our political project of immigration integration. Having formal agreements among the three levels of government created the framework for the NGO sector to engage municipalities on settlement and inclusion policies and programs. Social Planning Toronto and Newcomer Women's Services Toronto released “The Economy and Resilience of Newcomers: Exploring Newcomer Entrepreneurship”, a new community-based research study on newcomer self-employment in Toronto. The report highlights previously unpublished Statistics Canada data and results from a series of qualitative in-depth interviews with self-employed newcomers, service providers, cultural business associations and financial institutions. OCASI Accessibility Initiative wins CRRF Award! On November 18, 2014, the Ontario Council of Agencies Serving Immigrants was recognized by the Canadian Race Relations Foundation (CRRF) ‎for it's Accessibility Program with the 2014 Award of Excellence. The CRRF Awards of Excellence pays tribute to public, private and voluntary organizations whose efforts represent best practices in building awareness and understanding of Canadian values and identity that are reflective of Canadian diversity. OCASI Member Agencies voted unanimously in support of a By-Law change at the Council's 2014 Annual General Meeting, to create a designated Francophone Director position on the Board of Directors. This show of solidarity with our minority Francophone membership, demonstrates member agencies commitment to inclusive practices in the immigrant and refugee serving sector in Ontario. Would you like to get free, in-depth training on tenant and housing rights for yourself or your staff? The Toronto Tenant School for Settlement Workers will provide in-depth training in tenant rights to settlement workers whose clients may be facing housing difficulties. Registration deadline is Friday, December 19th 2014 at 5:00pm. Chatham-Kent Local Immigration Partnership (CK LIP) has released "Exploring the Impacts of Regulatory Change on Temporary Foreign Workers in Chatham-Kent", a report on the use of the Temporary Foreign Worker Programs (TFWP) in Chatham-Kent, and exploration of the impact of recent policy changes. The study was conducted beginning in October 2013, and is part of ongoing work of CK LIP to better integrate newcomers in the community and to bring awareness of specific challenges faced by Chatham-Kent's largest newcomer group, agricultural migrant workers. Ontario Nonprofit Network (ONN), the provincial network for Ontario's 55,000 nonprofits and charities has launched the first Ontario-only job site for nonprofits by a nonprofit. The site is free to search and subscribe, and will allow free postings until January 31, 2015. CLEO is pleased to announce the launch of a new publication: Not a Canadian citizen? Why you should think about applying now. The laws about Canadian citizenship are expected to change by June 2015. It will be harder to get and keep Canadian citizenship. This new publication in English and French explains why some permanent residents may want to apply before the laws change and why it is important to get legal advice before deciding. CLEO's new resource, Your Refugee Hearing, lets refugee claimants take an online tour of a hearing room. It also has practical information to help claimants before the hearing, on the day of the hearing and after the hearing. 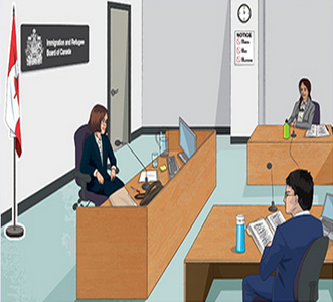 Visit refugeehearing.cleo.on.ca to see a hearing room on your desktop or mobile. For more information on refugee claims, visit refugee.cleo.on.ca.